The shape of things to come this spring is definitely round, particularly when donning sunglasses. Round frames are retro and contemporary, funky and sophisticated—in other words, just right. Strange, futuristic shapes abound. Let’s just say if you’re looking to keep a low profile, this is not for you. Spring promises a potpourri of octagons, stars, hearts and super-sized squares and circles, not to mention a few silhouettes that truly defy description. First introduced in the ’50s as the essence of femininity, the cat’s eye frame has never really gone out of style. The 2016 variation on this theme takes us from house cat to wildcat with bold, dramatic designs. Understatement is not this cat’s meow. As the name suggests, aviator frames were once the exclusive domain of World War II fighter pilots. For those looking to land a pair this spring, consider modern updates like round lenses, metal bridges and translucent plastic frames. When Pantone, the purveyor of all things color related, announced that Rose Quartz was its 2016 color of the year, the fashion world took notice. Not surprisingly, frames featuring the kinder, gentler shades of rosy pinks, pale blues, dusty greys and misty taupes are making their debut this spring. 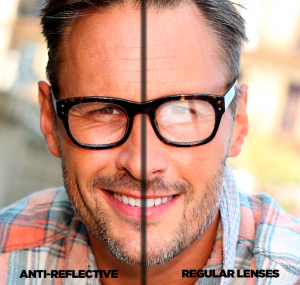 From clear to very (very) dark and just about every color of the rainbow in between, lenses are asserting themselves as both fashionable and functional. Just look at the ombre lens: it’s dark at the top and lighter at the bottom, giving you stylish practicality. Sometimes frames are about the embellishments and adornments. This spring anything goes, including animal-print patterns, jewels, colorful gemstones and crystals. The Pittsburgh and Cranberry locations of Good Looks Eyewear has all of your Spring fashion trends. Please stop in to either location to find your look for Spring. Contact us at either store for any and all inquiries. Currently, more than 3 million people in the United States have glaucoma, approximately 120,000 are blind from glaucoma, accounting for 9% to 12% of all cases of blindness. Glaucoma is called “the sneak thief of sight” since there are no symptoms and once vision is lost, it’s permanent. As much as 40% of vision can be lost without a person noticing. Those at higher risk include people of African, Asian, and Hispanic descent. Other high-risk groups include: people over 60, family members of those already diagnosed, diabetics, and people who are severely nearsighted. Regular eye exams are especially important for those at higher risk for glaucoma, and may help to prevent unnecessary vision loss. Talk to friends and family about glaucoma. If you have glaucoma, don’t keep it a secret. Let your family members know. Glaucoma patients, did you know that your eye pressure can be safely controlled without complex eye drop regimens? At Scott and Christie Eyecare Associates, we offer an alternative to eye drops and their side effects for glaucoma treatment: laser surgery that can greatly lessen or virtually eliminate your dependence on eye medications. Covered by insurance plans, this FDA-approved laser procedure is fast, safe and effective. . If you are interested in freeing yourself from the inconvenience of your current eye drop regimen and expensive monthly trips to the pharmacy, please contact Scott & Christie Eyecare Associates to see if laser surgery is right for you. Nike has collaborated with basketball superstar Kevin Durant to create 6 exclusive eyewear pieces that take the vision from Durant’s shoe line and bring it to the eyeglass world. 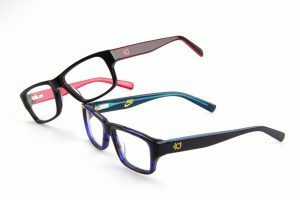 With 3 children and 3 adult style’s, these new fashionable, sporty, and trendsetting glasses set them apart from any other brand or style on the market. The eyeglasses will contain the KD logo as well as the infamous Nike swoosh on the frame. These frames are not just made to look good, they are made with the highest quality materials; either acetate or a metal/zyl combination, depending on the style purchased. Good Looks Eyewear is proud to showcase these frames. These are a Slam-Dunk of glasses that are made for any sports lover. Stop in to Good Looks Eyewear to purchase these one of a kind, head turning frames. Our AMO certified Opticians will be more than happy to ASSIST you.